As the weather is now getting colder and there is less sunlight, I am pleased to look around and see all of our programs in full swing. Students are enjoying their academic programs and our enrichment programs. It is great to be part of such an active school community. 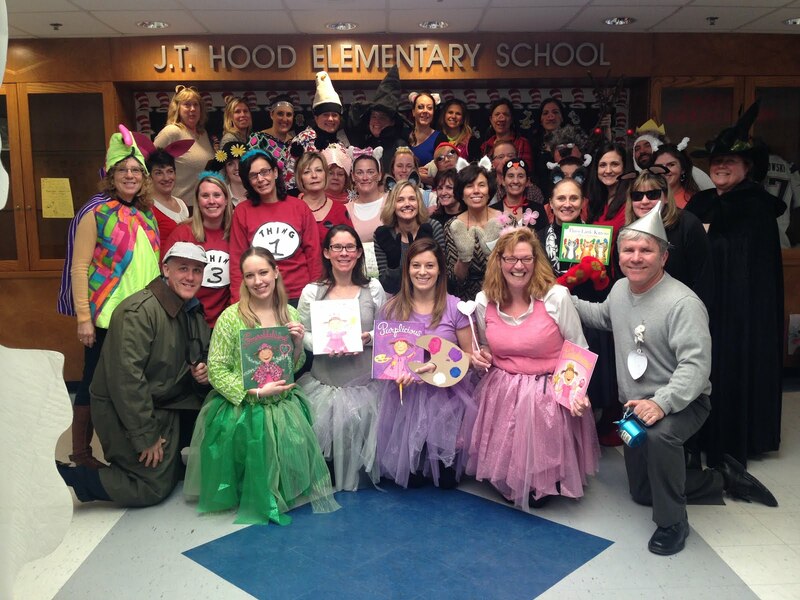 and support staff at the J. Turner Hood for your continued caring and nurturing of our children. Last month, speed painter Rob Surette wowed our students with his "Amazing Hero Art" show. Thanks to our Parent’s Association for organizing and funding the event. Mr. Surette created all the paintings you see here - each six feet tall - during his 60-minute show. We had previously had one of his works on display in our library and thanks to the Parent’s Association we will now have another that will be hung soon. Recess- The winter season is upon us. I would like to remind you to send your children to school dressed appropriately for outside recess. Coats, hats and gloves are very important. We will always go outside for recess unless it is dangerously cold. If recess is canceled, please understand that it was canceled due to rain, snow or health recommendations only. It is our belief that students need physical activity and fresh air and therefore we send the children outside for recess in the winter. Previously, J. Turner Hood School students were allowed to bring in snow pants and boots to play in the snow. This is a practice that we are discontinuing at this time. All children will play on the hot top during recess if snow is covering our playground and fields. Live Line-Dismissal/Pick-Up-The dismissal time from J. Turner Hood Elementary school is a very busy time of day. Busses are arriving to bring children home or bringing them to after school child care programs. Parents or child care providers are driving up to the neighborhoods near the school or walking up to pick up their children and older children are walking home alone. If you participate in the Placard Pick-up System to pick up your children in front of J. Turner Hood by car please be reminded that you are required to “queue up” in a single line down the driveway, through our parking lot and up to the Handicapped parking spot at the end of our “loop.” At all times, there must be space for two-way traffic on Haverhill Street and in the school driveway to allow for vehicles leaving and to provide emergency vehicle access. You (the parent/guardian) or someone you give permission to pick up your child must have the placard with the student’s last name in view on the right-hand side of the windshield as you pull up. A suggested practice is to have the placard affixed to your passenger side visor and flip it down while you “que up.” Children who are being picked up via the placard pick-up system will remain in the Cafeteria while family names are called. As you pull up with the placard in view, your child(ren) will be called out using a walkie talkie system from staff out on the sidewalk to staff in the cafeteria, and placed in your vehicle. The Annual North Reading Turkey Trot is scheduled to go off at 8:00 A.M. sharp on Thanksgiving Day. The elementary school challenge is on again this year and the Little School is looking to retain the title! We have recruited many staff members to join our families! I am encouraging all of our families to be part of this community event. It is our goal to unseat the defending elementary school challenge champions and bring the coveted trophy to our lobby! The elementary school in North Reading that has the highest percentage of student participation will earn the trophy to display in their school for the year and the $200.00 prize to be used toward the purchase of fitness equipment in their school. This event is sponsored by the NRHS Hornets Hall of Fame; proceeds benefit the student athletes of North Reading. Come out to work up an appetite. Please contact Joe Davis at jdavis@north-reading.k12.ma.us if you have any questions. See you Thanksgiving morning! Successful Hood School Students- There are a few things you can do at home to help your child be a successful student here at school. It is beneficial to set up routines for your morning prior to leaving the house. Setting up routines can help you and your child be more relaxed. Eating a good breakfast helps your child to be energized and ready for the day ahead. After school ask your child about his/her school day. It lets your child know you care. Talking about school with your child helps keep you connected. If your child isn’t sharing what he/she does at school try asking a specific question or two. Be sure to read all papers that come home or sent via e-mail. Help your child be prepared by studying a little each day. It is the best way to learn and own new material. Having a set homework time and place makes homework a little less stressful. Read everyday. Try reading both to and with your child each day. Lastly, having a set bedtime and nightly routine helps your child get the rest he/she needs. Providing your child with relaxation, energy, communication, preparation and rest create the potion for success! Communication between home and school is so important for our children. Please share anything important that is going on at home with your child’s classroom teacher. We can’t be successful without one another. Please be reminded that students may not be dropped off prior to 8:20 AM, as there is no morning supervision.